SprayWorks specializes in manufacturing custom built spray rigs for the mobile and in-plant operation application of spray foam and polyurea coatings. 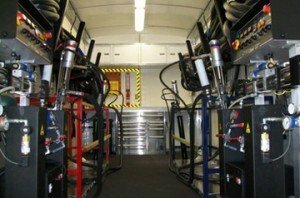 Building your own spray rig can be tough, which is why many spray foam and coatings applicators turn to SprayWorks for a Custom Spray Rig. Our spray rig engineers and application specialists work with you through the entire pre-design stage to design and build the right solution for you. If you have your own Box Truck or trailer, our certified experts can customize a plan to best maximize your rig's space in order to perform daily tasks. Alternatively, if you have complex project types that require several sets of foam and multiple proportioners, we can work with you to identify the best solution, while sourcing a trailer to fulfill your business needs. No Custom Rig is too difficult to create.